Could a plan to improve early education be putting the squeeze on child care centers? What would it take to make sure more of Louisiana’s youngest children are learning? In a state in which 43 percent of kids of kindergarten age are not ready to begin school, most of those involved in early education don’t deny there’s a problem, and many agree there is a way to fix it. The solution will come, experts say, from a recent effort to connect the hodgepodge of daycare centers, Head Start programs, private preschools and public school pre-K programs into one unified system. Through the new system the plan is to raise and unify standards, creating a single statewide network that ends the fragmentation and ensures “easy access to high-quality options,” according to the Louisiana Department of Education, the entity overseeing the reform. But directors of private daycare centers say there’s a problem with the state’s plan. Heather Comeaux, the owner of the Lafayette-based Doodlebugs Early Childhood Development Center, says the state’s efforts to improve quality could actually fuel higher tuition bills for parents and might even force her, and others like her, to close their doors altogether. 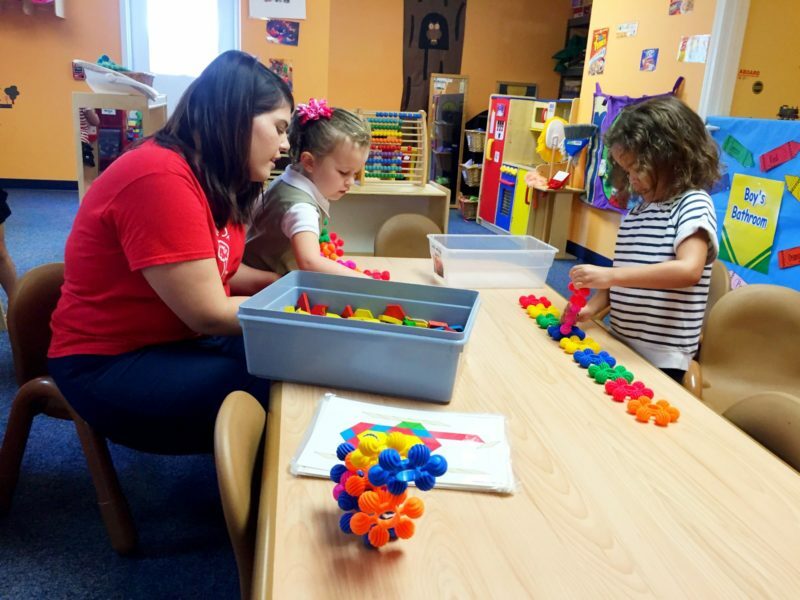 Child care center directors like Comeaux blame rising tuition and the threat of closure in part on an exodus of 4-year-olds from private programs to preschool programs funded by public dollars and held in public schools. In early education, tuition for older kids subsidizes costs for younger children: Infants and 2-year-olds require more resources, including lower teacher-to-child ratios, than 3- or 4-year-olds. As public schools continue to take in 4-year-olds, leaving private centers with the youngest, most expensive students — who have fewer public dollars subsidizing their care — the costs for child care centers are driven up to what some say are unsustainable levels. The Louisiana statewide network includes options for a “diverse delivery system,” a well-regarded national model for expanding early education that puts some publicly funded pre-K seats — the spots available to individual children — in private centers. But according to Bronfin, who points to data from the state’s Department of Education, less than 10 percent of the state’s publicly funded pre-K programs are in mixed delivery settings. Jenna Conway, the assistant superintendent of early childhood in the Louisiana Department of Education, acknowledges that the diverse delivery model hasn’t always been successful in Louisiana. She traces the current struggle to balance funding for both private and public programs back to an earlier reform in 2001: the Cecil J. Picard LA 4 Early Childhood Program, a primary preschool program in Louisiana that serves more than 16,000 children. The “LA-4” program provides full day pre-K, almost exclusively in public schools, to 4-year-olds from disadvantaged families. Twenty-seven percent of children in Louisiana live below the poverty line. Now, largely because of the LA4 program, 87 percent of at-risk 4-year-olds are served in publicly funded pre-kindergarten. Unfortunately, the implementation of LA4 hasn’t been as beneficial to child care providers. Related: Is Mississippi’s child care system backsliding? Instead of putting children whose seats were funded by LA4 in child care centers — an option allowed under the law for centers that met certain standards — most of those seats instead were placed in public schools. 87 percent — Percentage of at-risk 4-year-olds are served in publicly funded pre-kindergarten. Conway said the decision to place these children in public schools was made, in part, because the private child care system has, historically, had “mixed results” in terms of quality. Due to “challenging state budgets,” the number of LA4 slots has remained constant for several years, she said, so there are “few, if any” new slots to offer private providers like Comeaux. “The result is small, privately owned centers being forced to close their doors because we just cannot compete with a free service, and our largest competitor now being our governing body,” Comeaux said. The lack of 4-year-olds to offset the high costs of infant and toddler care is being exacerbated, Comeaux said, because the way the Department of Education’s new unified system is implemented often gives school districts control over where preschool kids, and the funds that go with them, end up. In her area, for example, the Lafayette Parish School System is the agency in charge of the coordinated enrollment system, and is also responsible — with some oversight by the state — for evaluating how well both public schools and private child care centers like Comeaux’s meet minimum academic standards required to qualify for funding. In addition to using agencies like the Lafayette Parish School System, which does the lion’s share of evaluations for centers like Comeaux’s, the state also contracts with the Picard Center at the University of Lafayette to audit and conduct third-party assessments. Regardless of the third-party oversight, some childcare providers say having a school district do most of the assessments is a conflict of interest. They say the school district is directing 4-year-olds away from private child care centers and into the school districts, so those public dollars can be added to the school district’s coffers. Comeaux adds that when a center receives a poor evaluation, it is not only placed at a disadvantage in receiving funding for 4-year-olds, but also for younger children whose educations are subsidized by programs like the Child Care Assistance Program. Conway said there is no “inherent” conflict of interest when a school district oversees a unified system that includes private child care centers. But Comeaux’s complaint has been echoed by other child care providers throughout the state, according to Melanie Bronfin, the executive director of Louisiana’s Policy Institute for Children. 4,600 — Number of at-risk children who will be served over four years through a $32 million Preschool Development Grant; 340 — the number of children served through the program last year. Bronfin, however, also said the Department of Education is making progress on providing affordable preschool in private centers in other ways. One is through the Nonpublic Schools Early Childhood Development Program, which currently provides publicly funded pre-K to more than 1,300 4-year-olds from low-income families. Children in that program receive education in both state-approved private preschools and child care centers, which make up about 44 percent of the providers in the program, according to statistics provided by the state Department of Education. Another ray of hope for private providers is the Preschool Development Grant, a $32 million funding stream that, over four years, is slated to expand preschool programs in high-need communities. The grant, which is distributed under a parent-choice model, will ultimately allow families of 4,600 at-risk 4-year-olds to choose from new, high-quality preschool options in diverse settings, including private child care, Head Start, nonpublic and public schools. The state has “strongly encouraged” community networks to offer new high-quality pre-K slots in child care, Conway said. In order to fill those mixed-delivery slots with high-quality care, the state Department of Education gives private child care providers extra funding to enable them to meet federal standards that include certified teachers, use of a specified curriculum, a 1:10 adult/child ratio and vision and hearing screening. The system is working, Conway says. About 70 percent of these Preschool Development Grant seats are currently offered in private child care settings. To some, however, the progress has been too slow. State statistics show that, as of last year, the grant was only offered to 340 of the state’s 4-year-olds. This year, that number is slated to reach 1,000 — a fraction of the 16,000 kids educated annually in LA4 programs, mostly in public schools. In the meantime, Bronfin said, several entities are left fighting over the seats that remain.